TAMPA—For many of the thousands of delegates in town for this week's Republican National Convention, getting to the convention site in downtown Tampa means a long bus ride through heavy traffic from hotels located as far as 40 miles away. But it's a different story for top donors to Mitt Romney's presidential campaign, many of whom are being housed this week at a Westin Hotel on Harbour Island just around the corner from the Tampa Bay Times Forum, the convention site. For supporters who were lucky enough to be rewarded with rooms at the Marriott Hotel, where Romney and his family are staying, the commute is even shorter—just a walk of a few hundred yards to security. But for some, the travel was made even easier. On Tuesday night, dozens of golf carts were spotted making round-trips from the hotels to the convention site, ferrying Republicans through a humid evening marked by the occasional raindrop. Prime lodging and personal shuttle services are just two of the perks being offered to donors who have contributed upwards of $75,000 apiece to Romney Victory, a joint fundraising committee between the Romney campaign, the Republican National Committee and a slew of state party committees. Amid word that President Barack Obama and the Democratic Party could raise more than a billion dollars ahead of Election Day, Romney has been in an all-out race for cash in recent months, headlining at least 100 fundraisers over the summer in hopes of building up his general election account. The reward for folks willing to ante up the checks is access—not just to Romney, but also to top Republican officials and key advisers to his campaign, who have been schmoozing with key GOP donors all week in Florida. "It's a little like a reunion," one Romney donor, who declined to give his name, told Yahoo News as he stood near the crowded bar at the Marriott on Tuesday night. He explained that he was among those who had made the trip to Park City, Utah, in June for a retreat for Romney donors where they heard from the candidate. He said he had seen many of the same faces here. The donor, who declined to say how much he had given to Romney and the RNC, said this week's events for Romney contributors are "like we're having our own convention." 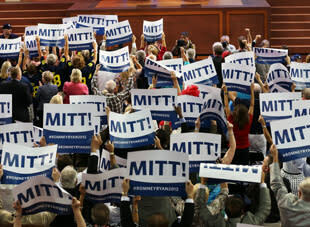 Indeed, Romney donors have gotten plenty of VIP treatment. Ahead of Rep. Paul Ryan's speech tonight at the RNC, donors will have the chance to mingle with former Minnesota Gov. Tim Pawlenty, former Mississippi Gov. Haley Barbour and South Carolina Gov. Nikki Haley at a private reception. Tomorrow Romney himself is expected to address his most generous donors just hours before he takes the stage to accept the Republican nomination. Every night top Romney donors have access to an exclusive VIP lounge at the RNC site, where they have one of the best views in the house. The party continues well into the night, with cocktail parties and receptions lasting into the early hours of the next morning. On Thursday night, Romney donors will wrap up their convention week with a private concert by former Eagles guitarist Don Felder. All of the events are happening behind closed doors. Reporters have even been waved away from the Westin, where former Florida Gov. Jeb Bush spoke to contributors earlier this week. At the Marriott bar, the Romney donor dismissed critics who suggest there's something nefarious going on behind closed doors. "It's just a group of people who have given a lot of money to support the Republican Party," the donor said as he sipped a beer. "Both sides do it. There's nothing to see here."